*ESP (Electronic Stability Program) now more commonly known in the auto industry as ESC (Electronic Stability Control) is a system that allows a vehicle to prevent itself from sliding when turning. Frank-Werner Mohn was an engineer at Mercedes-Benz for 35 years. In 1989, when he was still relatively new to the company he launched a W124 into a snowbank in Sweden. Frank was stuck. Waiting for assistance he had lots of time to think about what happened or more accurately, how to prevent it. Frank was in Sweden conducting testing for Mercedes. 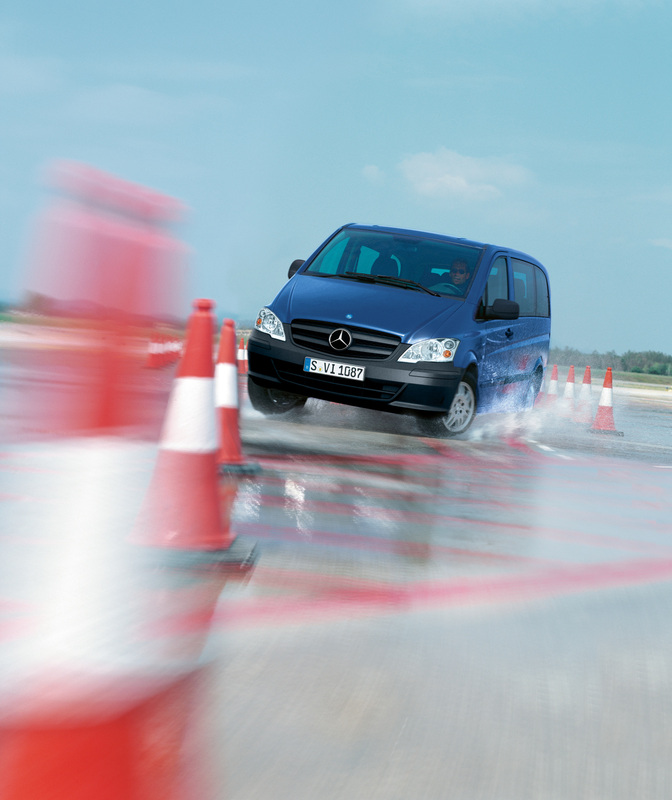 Mercedes had not long before that introduced anti-lock braking systems on most of their models. The way ABS essentially works is by using sensors at each wheel to measure speed relative to the speed the vehicle is traveling. 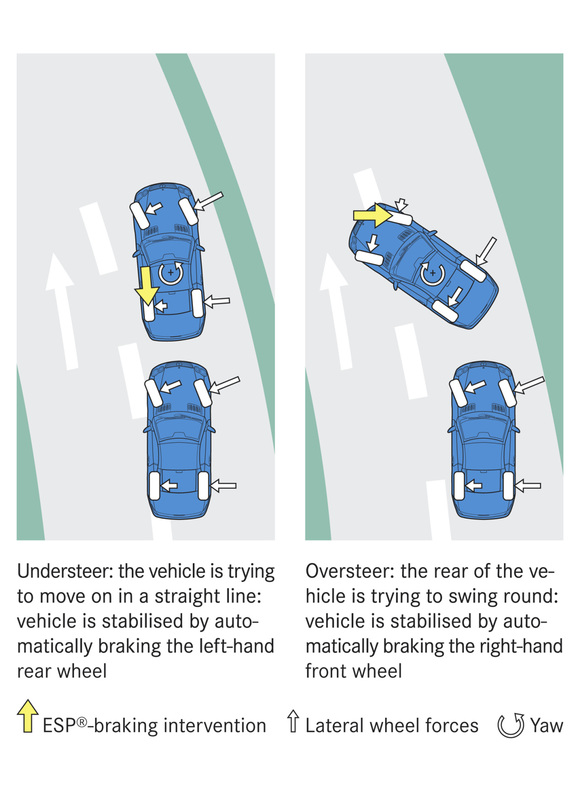 If under braking a computer determines one or more wheels are not turning at roughly the same speed as the others and the rate the vehicle is traveling a valve can be modulated to reduce braking force on the offending wheel or more specifically, the brake caliper piston. The question Frank had as he was stuck out in the cold was how this system already on the car could be used to not only aid in a braking emergency but prevent you from being in an emergency to begin with. Since he had some time to kill while waiting to be recovered and social media and Pokémon hadn’t yet been invented. He thought about additional ways to apply the existing tech. In the way that the wheel sensors measured the speed of the wheels relative to the speed of the vehicle he thought if the computer could also have data from the angle the front wheels as well as the yaw rate of the body of the car a computer could determine if the driver was trying to turn right but the car was sliding left. This would suggest to the computer that the car was in a skid or traveling in a direction that was unintended by the driver. The way to correct the vehicle traveling in an unintended direction would be to use the ABS system’s ability to individually apply braking at each wheel to bring the car back in line as well as telling the engine’s ECU (electronic control unit) to reduce power if needed. Eventually Frank was pulled out of the snowbank and he made it back to Stuttgart where work began on the idea. To measure the yaw rate of the car a gyro sensor needed to be employed, they found one at a toy shop cannibalizing a toy helicopter and later from a missile since it had higher precision and reliability. Within about two years, they had it figured out and working. It was early 1991. Testing showed that with the technology active on a frozen lake test course an average driver could drive with nearly the same precision and speed as a professional Mercedes driver. It was quickly decided to put the technology into Mercedes production vehicles. ESP system components. 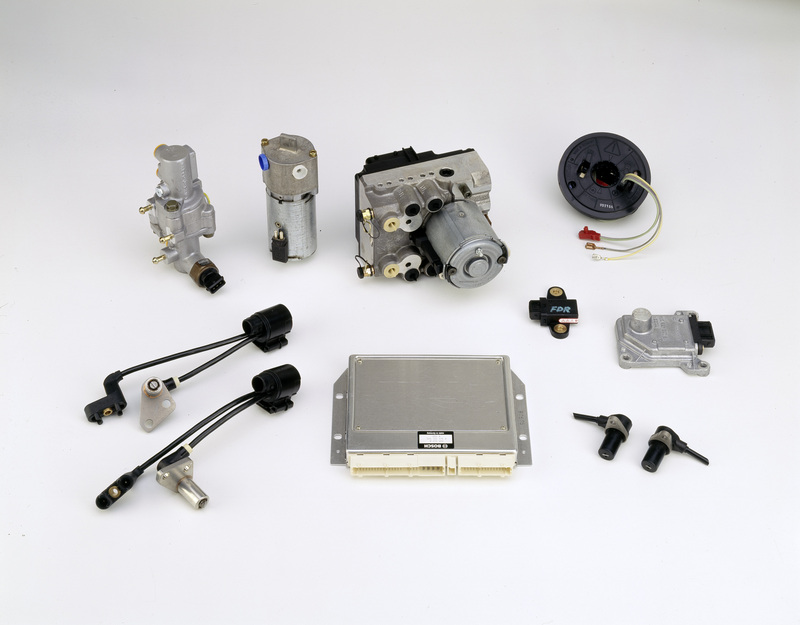 Later items such as electric steering would also be used with the system. As usual the S-Class got the new toys first. In the 1990s the W140 was the current S-Class and the system was introduced on 1995 models, the 1995 S600 C140 coupe got it first as standard. Not long after the system was available on the W140 sedans as well as the R129 SL. Standard on V12 models and optional initially on V8s it would soon become standard across all models, a fictitious moose helped with that. Yeah. 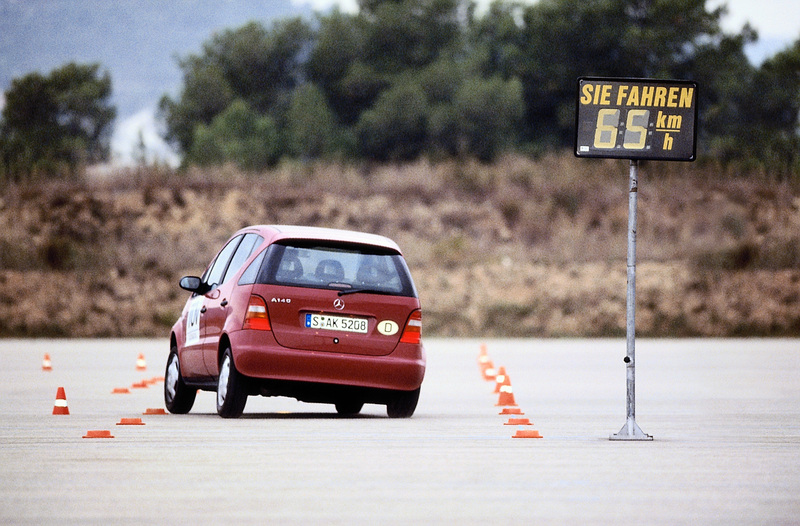 In 1997 the A-Class was being tested by a Swedish car technical magazine. In Sweden, where elk or moose wandering on the roadway are apparently a big enough problem to warrant a test named after them. The car was tested in a situation where it had to swerve from the lane it was in at 60km/h to the other lane and back…as if it was avoiding an Elk. The A-Class swerved but on swerving back, rolled onto its roof. This was a problem. Mercedes slapped ESP into the car and it worked flawlessly preventing the roll situation. It was made standard on the A-Class and we’d guess in a board room decision it was determined that having ESP standard on the cheap model but optional on higher models looked a little strange (as well as that whole saving lives and safety thing) that the decision was made to include it standard on all models. The system was so innovative and beneficial in the lives it could save and accidents it could prevent that Daimler gave away the patents for the system and allowed the companies that manufactured the components for it as well as the technology that controlled it to supply other automotive brands with the technology. Daimler felt the benefit to human life was greater than the royalties it could charge for the use of the tech. Over the decades since its introduction ESP has seen some modifications. As the hardware’s processing power has increased and accuracy of the components has improved the software has been modified to make use of the more accurate measurements the hardware can provide. Electric steering, which provides comfort and safety features like self-parking and lane assist are also used by ESP so the system can also turn the wheels in addition to individual wheel braking and engine control. All of this allow ESP today to be much less intrusive than previous generations. Improvements have been made to ESP allowing it to function better than ever. Canada in 2005 made it mandatory that any vehicle carrying hazardous goods be equipped with the system and required on all cars since 2011. Since 2011 it has been required on all new passenger cars in Europe. The United States has required it for all passenger vehicles under 10,000 pounds since 2012. The EU required all cars and commercial vehicles be equipped since 2014. What’s ironic is many Mercedes engineers questioned the project. In reality it’s now one of the greatest crash and death preventing technologies ever introduced in the automotive world. Once again proving if someone questions your idea not to let that deter you from what you know will be successful.